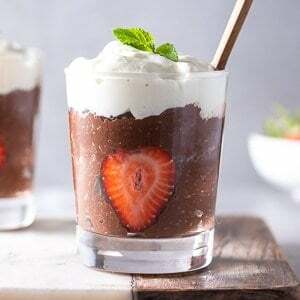 This chocolate chia pudding recipe only uses 5 ingredients, comes together in one bowl, and is low-carb and diabetes friendly. It's also vegan and gluten-free! Sift the cocoa powder into a bowl to get rid of any lumps. Whisk together all of the ingredients in a mixing bowl until smooth and well incorporated. Cover and refrigerate for at least an hour or overnight if you prefer. The longer you let it set, the firmer the pudding will be. Storage: The chocolate chia pudding will keep well in the refrigerator for up to 4 days.